I read and loved Let's Pretend This Never Happened (read my review here), so I knew that I would really enjoy Furiously Happy. However, I didn't expect this book to touch my heart the way that it did. Jenny Lawson is a well-recognized advocate for breaking the stimga surrounding mental illness. She opens up about her own struggles in Furiously Happy, and her transparency made me love her even more. There were so many aspects of her feelings and life that I identified with, and I got a lot of peace in knowing that I wasn't alone. I also loved reading about how Jenny copes with her symptoms. For example, Jenny has several sleep disorders which cause severe insomnia. Instead of laying in bed fretting about not sleeping, she has cat rodeos in her kitchen at 3:00 am. She straps her smaller taxidermied animals onto her cats and has them race to see which cat can keep the animal on their back the longest. This scene was one of my favorites in the book and one that I keep coming back to when I struggle with insomnia. One might think that this book is heavy or depressing. It's the complete opposite. Jenny strikes the perfect balance between intense and light hearted emotion. A chapter about her worst struggles is followed by a short chapter about her most recent fight with her husband Victor (these fights are always hilarious, by the way). At its heart, Furiously Happy is about making the best life out of your particular circumstances, whatever they may be. It made me smile, cry, and left me with a feeling of intense hope. Jenny's blog is a place where people can come together, share their struggles with mental illness, and feel accepted no matter what. Furiously Happy expounds on this feeling of community and unconditional acceptance. Even though I was reading this book in my own home, completely alone, I felt surrounded by the experience of all of those who have gone before me, and those going through a hard time with me right now. And that's an incredible feeling...one that is rarely found in a book. 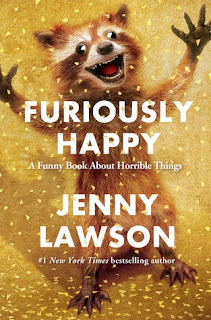 I can't say enough good things about Furiously Happy. I highly recommend it!